I will be attending/running a tournament this weekend (the 9th) and here is the list I'll be taking, complete with spiffy new formations from both the Tau Empire codex and the Warzone Damocles: Mont'ka supplement. Check out what I'll be bringing! First, some housekeeping. The format and FAQ are ITC (google it if you have no idea what that means). However, instead of using the ITC missions, this tournament uses two Maelstrom missions and one Eternal mission (Purge the Alien). So I picked up some Farsight Enclaves data cards to show my team spirit. Unfortunately, I don't think my team spirit is enough that I'll be using the FSE warlord traits. Up to 3 detachments are allowed, with various other restrictions on those detachments, and LOW are limited. 1850 points, 3 rounds, ~16 players, etc. I built my list knowing certain armies will be present. For the most part, they are all pretty good players with a few cut-throats thrown in. Given how little time I spend at the table, I will be quite happy to just finish in the top half of the field. These are the big ones. There are other generic lists coming as well, but these are the ones that caught my attention. Space Marines will be there a-plenty but I'm not sure if anyone will be running a Gladius, especially considering the first mission is Kill Points. The OSC is nearly mandatory in Tau lists these days. The bonuses are just too good to pass up and I love my Stealth Suits already. I have attempted to add some extra synergy via Homing Beacons and Gun Drones, taking advantage of the Drone Net special rule. The drones are my only source of Markerlights and the cheapest way to fill the Auxiliary slot in the Dawn Blade. I don't expect them to give me more than a couple marker hits a turn since they are only BS3. Those markerlights are very important though, since it is my only source of Ignores Cover for the low AP weapons. The Net is basically my Interceptor multiplier, allowing me to hit back hard in my opponent's turn. The Retaliation Cadre is a bit unwieldy, but I've tried to make it as versatile as possible. The large quantity of EWO allows me to respond to Drop Pods and other reserves before I start taking casualties (very important for my army). So even if my opponent gets the 'drop' on me, despite my deployment shenanigans, I won't be caught with my pants around my ankles. The Retaliation Cadre's deployment shenanigans are awesome and I hope they give me the edge I need. If you are unsure what the bonuses for these formations are, check out the formation reviews Here and Here. I'm glad you asked. I'm not entirely sure myself. I know that this list has some greatness in it, I just haven't had the revelation on what it is yet. I am hoping that that greatness will shine forth as I use it on the table. I've tried to make sure that each formation benefits the others in some way, rather than attempt to make each formation entirely self sufficient. I am excited to use the Killing Blow ability to remove key enemy targets too. So the plan is to recognize the weaknesses in my list and play to my strengths. My main strength, which I took care to have, is Killing Blow and the ability to orchestrate a heavy Alpha Strike even if the first rolls of the game don't go my way. So I need to have my wits about me in the deployment phase and I need to properly locate the linchpin units of my opponents' armies. If the strike falls flat and I keep picking the wrong Killing Blow targets, then I'm toast and I deserve it. My main weaknesses are unit count and objective control. I have no Obsec and only 9 of my 13 units can score at all. That, plus my generally short-ranged army, means I'll likely be clumping objectives as close together as possible so I can control where my opponents send their units and maximize the scoring ability of my own units at the same time. Naturally, this plan might change if I am faced with an army I have a numbers or mobility advantage against. My army can't take very much punishment and relies heavily on landing a decisive blow early to control the engagement (Mont'ka baby!) So, in most cases, I will be deploying lots of reserves to conserve my strength for the knockout punch. At the same time, I have a relatively large number of Kill Points (13) and the drones are easy targets for First Blood or the various Kill Point tactical objectives. Against flyers, I am hoping that the Ghostkeel is enough until they are forced to the ground to grab objectives. If not, then I am hoping my units can hunker down in cover long enough to win on objectives. Against MSU spam, I am relying on my army's generally elite status to win matchups. Aside from the Drones, most units are capable of wiping out a small unit on their own, especially if they get a marker hit or two. Against Superheavies or MC spam I think I am well set. 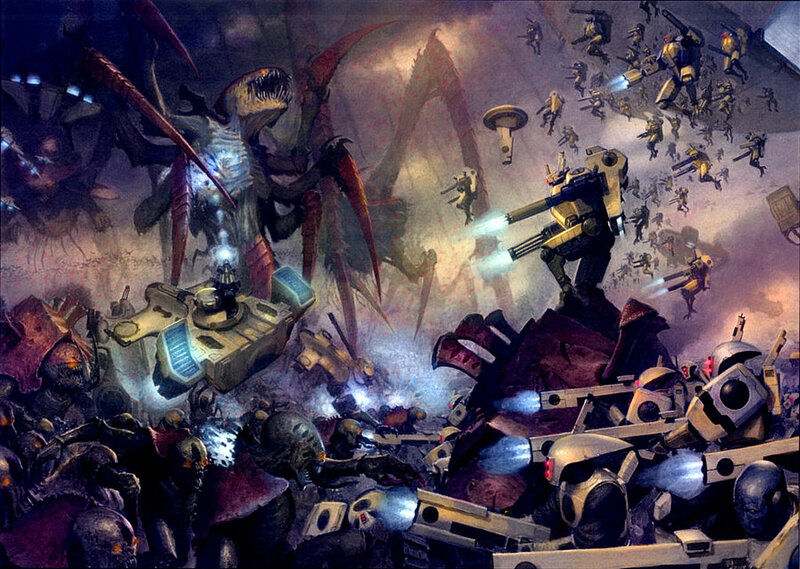 Plasma Rifles are perfect for the MC's and the S7 spam should be enough to take out an Imperial Knight if operating under Killing Blow. Units relying on cover shouldn't be too much of a problem for my OSC or units assisted by the marker drones. Even invisible units aren't nearly as bad under the ITC format. Deathstars are unlikely, but the Killing Blow will be a huge bonus against one. My marker drones are very important, and pretty fragile. If I think my opponent knows how critical they are to my army's accuracy, then I'll have to put them in Reserve and hope they come on with the rest of the army. All in all, my plan is pretty generic and I tried to make the list with "winging it" in mind. It might not be hyper optimized, but I feel I have kept it fairly well equipped to accomplish what I want it to: Kill something dead. If I don't outplay my opponent, then I'm in big trouble since my list certainly has some weak areas that can be exploited throughout the tournament. Thanks for reading, I'll be sure to post up how the list did! Edit: I feel very embarrassed now. I was unable to play in the tournament because we ended up with an odd number of players and as the TO I was naturally the one that should sit out. The field looked awesome and I'm bummed it didn't happen, but at least these tourneys keep people coming and keep the hobby alive in my area!